The Kamik Snowvalley Boots are a blend of practical performance and great style. Suede trims and a faux-fur collar provide the look, while durable, waterproof fabric keeps feet dry. 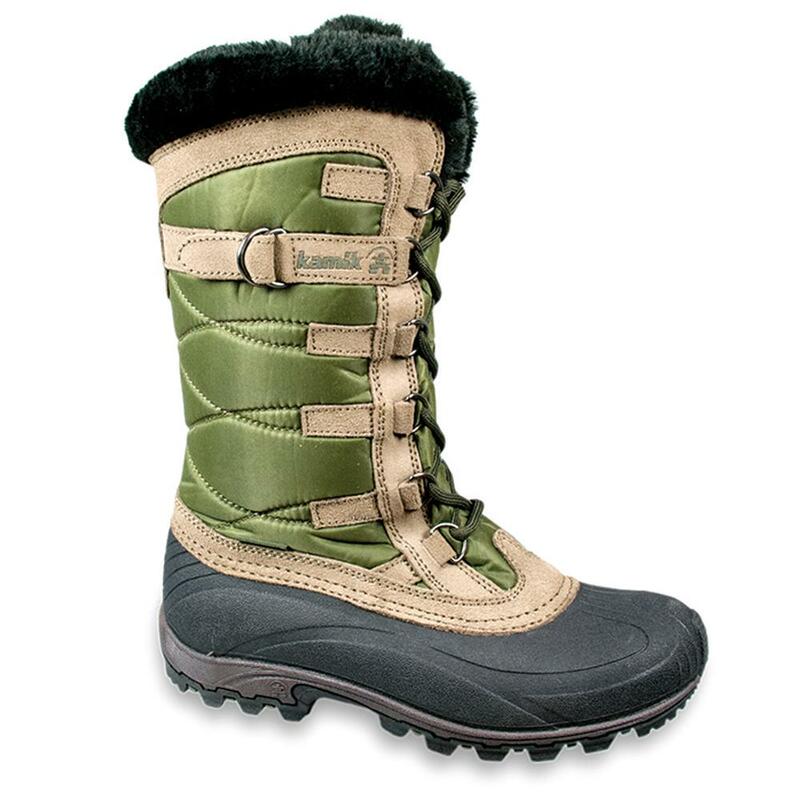 The Snowvalley Boots have a warm 200g Thinsulate insulation that's cold-rated down to -25°F. A removable EVA insole cushions the feet, and can be easily swapped with your custom orthotics for extra comfort. These tall winter boots come up to the mid shin for added protection against the snow. "Does this boot have the same pull closure as the Momentum style that doesn't need to be tied? Also, is the lining all the way down in the boot? Thanks." "These boots have a speed lacing technology which differs from the pull ties on the Momentum. The plush lining of the boot goes to just below the collar of the boot. " "Do these come in a size 10.5 or 11?" "We have them only in smaller sizes right now." "I wear a size 7 1/2 shoe. If I order a size 8 is it going to be too large? I am willing to wear a thicker sock with them." "In the product video, we suggest a half size down as this boot runs a little large. However, if you are wearing a thicker sock you may be able to get away with a size 8." "So this boot is listed as "30% off" but when i put the boot in the cart it says $114.93 on sale now for $114.93. Wouldn't 30% off be $80.46?" "There is a price range for this item from $79.99 - $114.93. Only certain colorways and sizes are marked down 30%." "Where are these boots made?" "These boots are made in China. " "Are these boots waterproof if they go into water, like for getting in and out of a Zodiac boat? " "These boots are Waterproof and seam sealed. For the highest amount of waterproofing, we recommend looking for a pair of boots or shoes that have a Gore-tex membrane. " "Why does this boot say it's 58% off but the price doesn't reflect the sale price?" "Specific sizes and colorways are on sale. There is a range of prices on the product page to reflect the price difference. You will need to click on a colorway and size to see which ones are on sale at this time. Hope this information helps. " "Is there any difference between the Snow Valley and the Snow Valley 2 where the snow valleys that were made two years ago has the width changed from medium did it change to something else"
"Thank you for your inquiry. The Kamik Snowvalley Boot is the 2017 winter edition. The difference in the Kamik SnoValley 2 are the colors. We hope this information helps! " First time purchase with this co. Excellent website easy to use, fast shipping. And I have already reordered other boots for my family. So very happy. The BEST winter boot I have ever purchased!!! These boots are phenomenally comfortable. They are the first pair that have not rubbed the back of my ankle raw. Super warm, and not heavy and Cute to boot! Bought them as a present for my daughter. She loves them. They were a present for my daughter. Love my new snow boots! Good looking, comfortable, well made snow boots. Very happy that I purchased them and best of all they were on sale.